When your business takes on an expense you should record the expense in Harpoon. This will allow you to keep accurate records for profit/loss and tax purposes. An example of an expense might be a new computer, or paper for your office printer, or paying a contractor to help with a project. 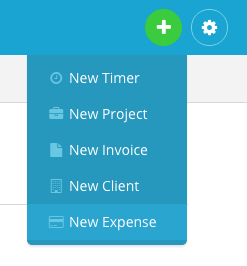 To create an expense click on the green Create menu in the top right of your screen and select New Expense. You’ll now be presented with the New Expense form. Date: Date the expense was incurred. Category: Select a category that’s close to the way you’d categorize the expense for tax purposes. If you’re not sure what category is the best fit for a given expense ask your accountant. Amount: How much was the expense? 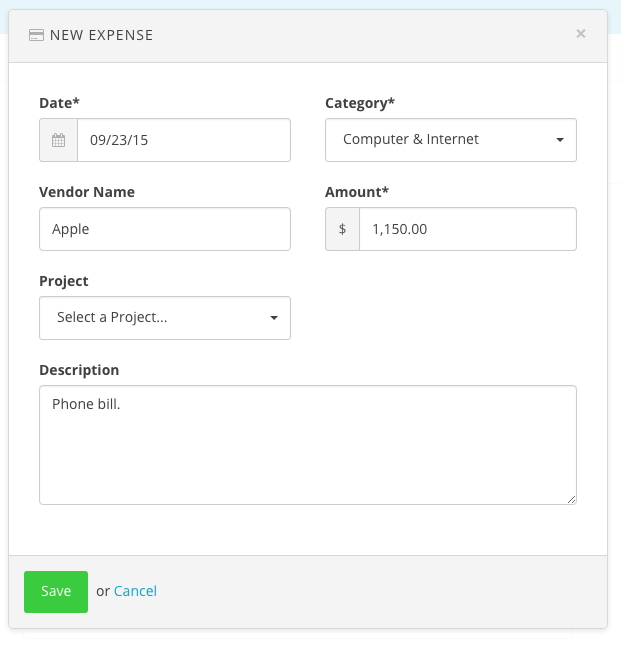 Project: This is optional, but if you’d like to associate an expense with a project you can do so by selecting a project from the drop down menu. Doing so will list the expense on the Project Details screen for the project, as well as allow you to add the expense to an invoice for the project in order to get reimbursed. Project expenses will have a status of either “Billed” or “Unbilled” and also get calculated into a project’s profit/loss metrics. Description: Any other details you’d like to remember about the expense can be added here. Save your new expense and you’ll be presented with the Project Details screen for the project the expense was assigned to; otherwise you’ll be presented with the main Expenses screen. Note: There are two places to view your expenses in Harpoon. The most obvious place is the main Expenses screen. But you can also manage expenses on a per project basis by viewing the Expenses tab on each project’s Project Details screen. To learn more about Expenses and other related topics (e.g. Retainers) view the Expenses support articles.